In 1956, a man named Jeff Broomhead left Australia for Papua, New Guinea, with the dream of starting his own coffee plantation. During World War II, while serving in the Royal Australian Air Force, he had fallen in love with the small country and its people. After acquiring land in the Wahgi Valley, he cleared ground and planted 150 acres of Arabica beans. 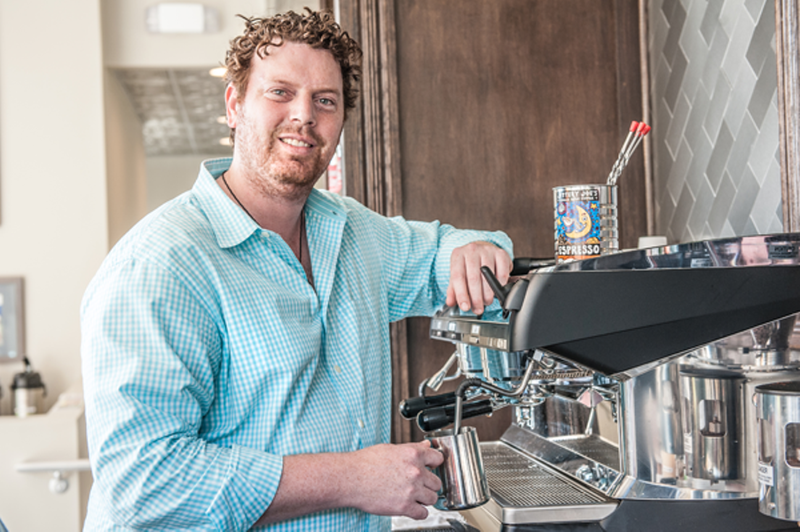 Fast-forward 60 years and his grandson, Geoff Broomhead, is carrying on the family's legacy with Ozpresso (3123 N. Davidson St.), an Australian-style coffee shop in Charlotte. Australian-style coffee shops, which differentiate themselves from American shops by technique, aren't an entirely new concept; they've existed for years in places like New York City, where young Australian entrepreneurs immigrated to tap into the specialty coffee market. But for Charlotte, Ozpresso is one of the first to offer a taste of coffee the way it's enjoyed in the land down under. Creative Loafing: What inspired you to open Ozpresso? Geoff Broomhead: My inspiration was the lack of a good cup of coffee in America, in the Southeast especially. What was so frustrating was seeing that most Americans don't know what a good cup of coffee is. I knew that we could do it, as in replicate the taste of Australian coffee. I wanted to introduce people to something they had never tasted. Seeing the amount of places like Caribou, Peet's and Starbucks and noticing how popular the coffee culture is here yet knowing that [Americans] haven't had a good cup of coffee, that's what really inspired me. You source your coffee from Jittery Joe's in Athens. What made you decide to go with its beans? It was kind of a coincidence. One of the owners used to live in Singapore with my cousin. So, I went down there to chat with them and learn more about their coffee. There were a couple areas of American coffee that I didn't know about. For example, I didn't know anything about brewed coffee. We don't do brewed coffee at all in Australia; we only do espresso. And, we don't understand why [Americans] drink brewed coffee because to be honest with you, it's not nearly as good as espresso [laughs]. So, I wanted to speak to him about a few things, including brewed coffee, and I went out back and met his roaster, Christian, and tried the coffee and it was actually really good. They're an independent chain and have about 12 shops in and around Athens. They're really interested in premium beans and they send Christian and a couple others down to the farms to meet the farmers to tell them things like, 'We like the stuff from that paddock but not that paddock,' or 'You need to change this or harvest a little bit quicker or later,' so they're really in communication with the suppliers about how they want their coffee. Why did you choose to open your shop in Charlotte? I love Charlotte because it's a big, small city. I also loved the climate here, the affordability and the people. I couldn't think of a better place than NoDa to open a coffee shop. I've found the community here to be very supportive. It's obviously the arts district of Charlotte, so what better place to have a coffee shop? I initially looked Uptown but the Starbucks inside Duke Energy beat me out by about two weeks. I'm actually glad because our clientele is super friendly down here and they're not in such a hurry.